Motor yacht BLUE BAY is 36,10m (118' 5") in length and has 5 luxurious staterooms which can comfortably accommodate 10-11 guests. 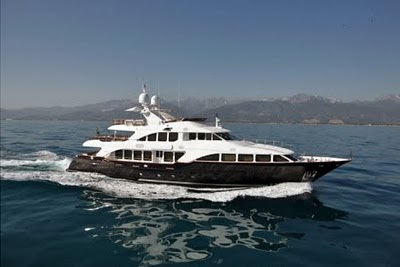 She has a striking navy blue colored hull with a white superstructure and an elegant interior featuring neutral colors and beautifully crafted light wood along with plenty of natural light cascading through the large windows. The master stateroom which is located on the main deck has wrap around windows and a king size bed. She has Two VIP staterooms and two twin staterooms as well as one pullman berth on the lower deck. All cabins have their own private en-suite and televisions. Click here for charter rates and availability.